"Fast feature matching for detailed point cloud generation"
IPTA2016, Oulu, Finland, 12-15 Dec 2016. 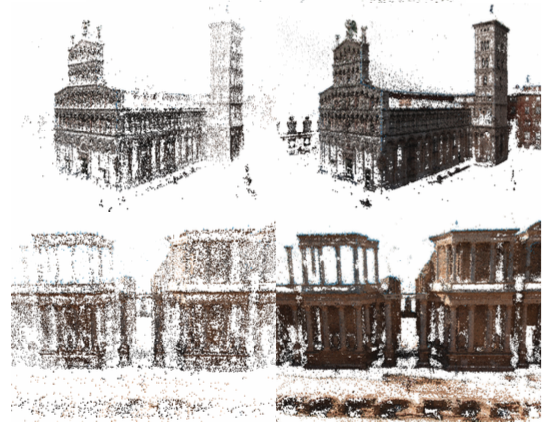 Structure from motion is a very popular technique for obtaining three-dimensional point cloud-based reconstruc- tions of objects from unorganised sets of images by analysing the correspondences between feature points detected in those images. However, the point clouds stemming from usual feature point extractors such as SIFT are frequently too sparse for reliable surface recovery. In this paper we show that alternate feature descriptors such as A-KAZE, which provide denser coverage of images, yield better results and more detailed point clouds. Unfortunately, the use of a dramatically increased number of points per image poses a computational challenge. We propose a technique based on epipolar geometry restrictions to significantly cut down on processing time and an efficient implementation thereof on a GPU.